On the afternoon of May 31, 2011, Vice Foreign Minister Fu Ying on invitation met with visiting British FCO Minister of State Jeremy Browne. Fu made positive comments on the current China-UK relations, emphasizing stable cooperation should be based on mutual respect and equality. She hoped that the two Foreign Ministries will maintain close communication and enhance coordination to gradually deepen China-UK comprehensive strategic partnership. Browne said the British coalition government attaches importance to developing ties with China and is ready to deepen pragmatic cooperation between the two countries on economy, trade, education and humanities. Jeremy Browne was appointed Minister of State at the Foreign and Commonwealth Office on 14 May 2010. He is responsible for Far East (including China), Olympics and public diplomacy. 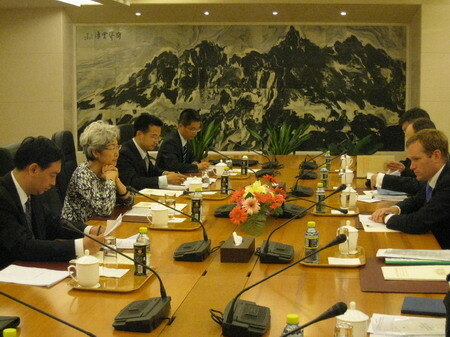 Browne is visiting China as guest of the British Embassy in China. Besides Beijing, he will also visit Guangzhou, Shenzhen and Hong Kong.